Overall, 2017 was a very good photography year for me. I went to Hong Kong (twice), Japan, Taiwan, and the Grand Tetons. More importantly, I began to more consistently dig for inspiration. I found Thomas Heaton's YouTube channel, and watching his videos helped to kick-start my motivation and get me out shooting more often. I also became more active on social media, and while the accounts that are not my personal twitter are still struggling for followers, those channels still provide a good way to find motivation locally. Now, if only the largest local feature instagram account would stop selecting bad VSCO and ++clarity images, but... that's an issue for another time. For too long, I was depending on the big trips to inspire me to take my big camera out. I live in a beautiful part of the world, with great landscapes an hour north and great cityscape and street photo opportunities 10 minutes to the south. It has been too long since I consistently took advantage of that, and the more frequent trips have helped me to grow as a photographer. Even though most of the images before are not local, the galleries on this website do have quite a few images from around here this year. This was an easy call. A lot of things had to come together to make this photo happen. I wasn't even supposed to go to the Tetons this year; the trip was only scheduled after I got sick and missed the eclipse. I was sleeping over half an hour away from here, so I had to get up at 4:45 and arrive early to get set up. My knowledge of the various vantage points paid off too. 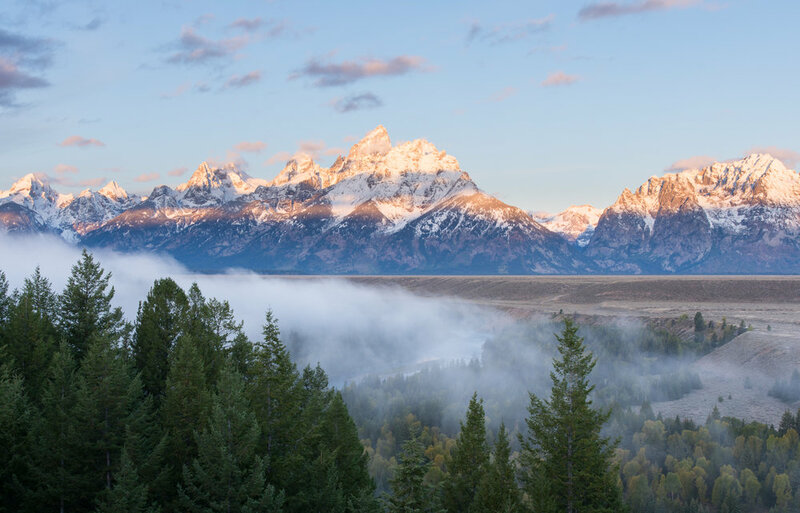 I was originally planning on going about 15 minutes further up the river to Oxbow Bend, but Oxbow Bend is at river-level while the Snake River Overlook is more elevated above the fog. Without that knowledge, I wouldn't have known to stop here and would have been stuck with low visibility. And, of course, I needed the sunrise to actually be good. This wasn't the most colorful sunrise I've ever seen, but it delivered in another visually interesting way that has only grown on me with time. I even had to learn a new processing technique to make sure the foreground and background were balanced. Put it together and it's a result I'm still very proud of, partially because I don't think I would have been able to pull this photo off a few years ago. I still think about the adjusting the exposure balance sometimes but it's the type of photo which will be headlining my portfolio for years to come. I love it. I love this photo because it is a rare view which captures what is so special about the city of Kyoto. 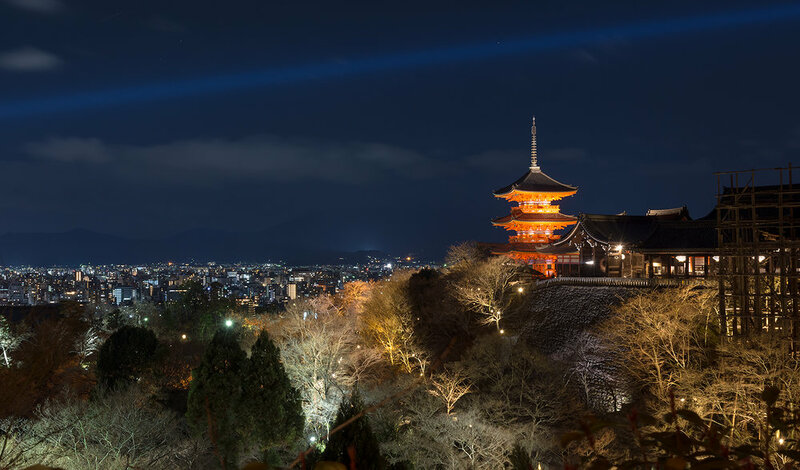 Kyomizu-dera, the complex of temples seen on the right side of this photo, is very rarely open at night. The Higashiyama Hanatouro festival, which I was able to see in March, is one of the few opportunities to see it after dark. I took a photo with the same composition in 2016, but the night lighting really helps to emphasize the traditional temple against the modern city in the background. Fortunately, I wasn't yelled at for using my tripod until after I got this. Now that I know a few more localized processing techniques I may try to calm down the brightness of some of the foreground trees for a future re-processing of this image. I also wish that my tripod was a little taller for a better foreground perspective. Even so, I think the photo still stands well on its own. It made the 16 miles I walked with a head cold that day (according to my pedometer) feel extremely worth it. This is another photo which was the result of a significant amount of planning. My company moved into an office about 100 yards away from this photo in early 2016. The reflections of the neon signs on the surrounding buildings immediately stuck out to me, as well as the reflections on the road during the rain. The photo also needed to be at dusk to help with visibility of the buildings in the background. I also needed a camera with me that was good enough to handhold in the dark. The elements finally came together in September, and the woman in red and the cyclist helped to make the photo that much better. This photo is a technical disaster. It's not sharp, the focus is about 10 feet in front of the subject of the image, and the protective netting is distracting. The composition is a bit wrong, too far to the right. Even the normally forgiving web-size export can't hide all of the issues. Instead, this is about the moment. In a winner-take-all game in the first game of the World Baseball Classic, Cuba was trailing Australia in the middle innings. The best hitter on Cuba's roster by far, Alfredo Despaigne, was at the plate. Despaigne is also one of my favorite players in the world, and since he has not defected from Cuba, chances to see him play in person are rare for me. 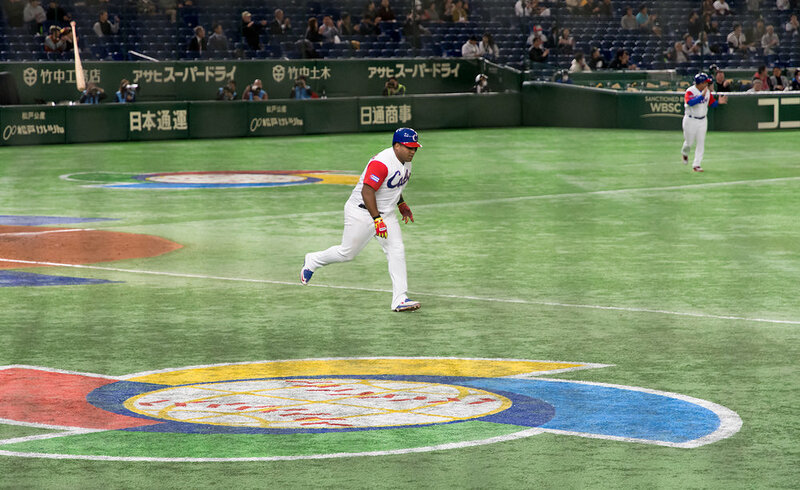 Despaigne hit a grand slam, which provided Cuba's only runs in a 4-3 victory that advanced them to the next round. Watching Despaigne celebrate by flipping his bat, and then turning to watch Cuba's fans celebrate behind the first base dugout, is not something that I'll soon forget. Even if I'm a terrible sports photographer. The reason why I'm most proud of this one is because it took a lot of work to capture. This photo was taken about 650 miles north of where I live, and at times I was even 100 miles beyond that. This was also just a weekend trip, and it also re-traced a lot of ground that I've covered before. The chance for getting other images was very low. I just wanted something like this. The perseverance required to get this will stick with me. It wasn't just driving north and waiting, the aurora played hard to get. This event was supposed to be huge. The photos coming out of Europe were incredible, and far enough south that I should have been able to see the aurora overhead. Even just before sundown, as I pulled out of Chibougamau, Quebec, conditions were supposed to be very good. Then, as the sun set and dark took over, there was nothing. The aurora had disappeared just before I was able to see it. I ventured further north and west, but the extra distance revealed no aurora and no north-facing landscape opportunities. Instead, I headed south towards the next day's driving route, and also towards some nice north-facing bridge overpasses that I spotted in the late afternoon hours. 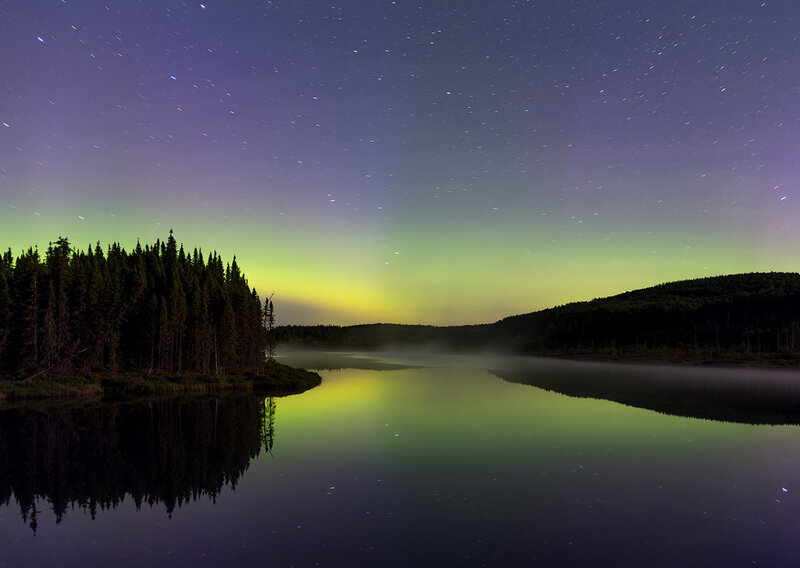 Finally, around 2AM, after a lot of sadness and caffeine, the aurora came back. Not as bright as what I was hoping for, mind you, but I still got something special. Pushing until 2AM also ensured that the rising moon would light the foreground mist ever-so-slightly, but not while overwhelming the rest of the image. There are some things I wish I did differently about this one, but I think it still works, and it's something that I will be incredibly proud of for a very long time. 2018 should be another busy year for photography. In March, I am going to spend about two weeks in northern Norway, chasing the aurora and looking for landscape opportunities on the fjord-heavy Lofoten Islands. This is a dream trip for me, but it will not be without its challenges. While the Gulf Stream keeps that area warmer than you would expect, March in the Arctic Circle will still be very cold. As a result, I am planning to be much more active with the camera locally in winter than usual, because it will be good practice for the impending cold trip. Later in the year I am tentatively planning another trip to Japan, but it's too early to know specific details. Right now I am hoping for something like a two week trip. I'd like to do more landscape work than my previous trips there, which have generally focused around city and travel photography. A landscape trip would likely involve renting a car, so I guess I need to learn how to drive on the left-hand side of the road. I hear there are good seaside landscape opportunities in Tohoku and Hokkaido, and of course Japan is covered in beautiful mountains. It's also a good chance to practice my Japanese, of course. By then hopefully I will have enough knowledge of the language to get around in more rural areas. Locally, I'd like to be a little more involved in photographing the White Mountains of New Hampshire. There are some concerns here, particularly financial. 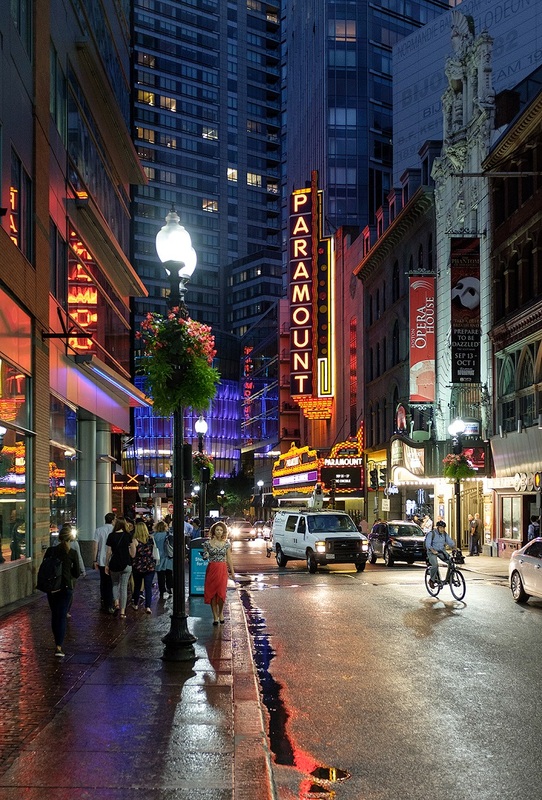 During the summer, this is prime vacation area for New Englanders, so hotels start at $100/night and most are much higher than that. If I want to do frequent photography up there, I will need to do further investigation into camping in the area. That isn't always cheap either, but it would open up a few more chances per year. My hike to Bridal Veil Falls was one of the more fun things I did this year (minus the close encounter with a bear), so I'd like to continue doing more stuff like that in 2018. There are also some things that I still need to improve. "Shoot more" is always the number one thing, and it always will be. Additionally, there are still quite a few things I need to get better at in post-processing, again focusing on motivation. I have half-written blog posts from Japan, Wyoming, and Bolivia (yes, the 2015 trip). I genuinely believe that this type of blog post is a unique way to capitalize on my strengths (I'm never going to be charismatic enough to be a YouTube photographer, for example). Where they fall down is that they take a lot of work, and I generally find post-processing to be tedious. It saps motivation. However, if I can provide something unique and write something that people want to read, it will help me grow this site and lead to some more interesting opportunities going forward. 2017 was a good year for learning more about the ins and outs of Lightroom CC, but I'm still sitting on some good images from previous trips because I don't know how to do everything. Even some stuff that I posted didn't come out quite like I imagined when I was seeing it live. That disconnect is a problem, and it's something that I need to get better in order to continue my growth as a photographer. I'm never going to be somebody who over-processes their colors, but sometimes the most dynamic scenes are the ones that need the most work in the computer. In 2018, social media will continue to be a big focus. Right now I have 100 followers on Instagram, about 250 on Flickr, and 33 on 500px. I have a lot of work to do in order to get these numbers higher and to get more people to see my work. I genuinely believe that the audience is out there, and I just need to connect with them. Launching this website last year was a good first step, because it created a centralized hub for my photography, but the goal is always "more eyes." If I keep working, I think I can accomplish this goal. Most of the time, people would say "I wouldn't be doing this without you" in this space. That's not really the case for me, photography is such a passion for me that I'd still do it if nobody was looking. However, that people do care about my work is very gratifying and makes it easier to keep going during the motivational valleys. Genuinely, thank you for reading and looking. It means a lot to me. Hopefully 2018 will be as good of a year for photography as 2017, and you will have that much more from me to see.